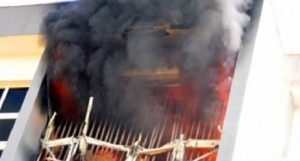 Unidentified assailants suspected to be members of a political party have set fire on a building housing the offices of the Independent National Electoral Commission (INEC) at Mgboko, headquarters of Obingwa Local Area Council in Abia State. Governor Okezie Ikpeazu, who has inspected the scene of the fire incident, totally condemned the act, describing the perpetrators as “enemies of the state”. Mr Ikpeazu expressed shock at the level of damage done to the building and urged the police and other law enforcement agencies to ensure that the culprits were brought to book. He called on the Police and the Army to beef up security in all INEC formations in the state to forestall any such incidents. The Governor condemned the tendency of some disgruntled elements in the society to vandalise public property, stressing that such acts were big drawbacks to the efforts of government in providing dividend of democracy to the residents. The Governor reiterated the determination of his government to maintain law and order and protect lives and property of the Abia citizenry.